ULTRA Europe presents the second annual ‘Destination ULTRA – Croatia Music Week’ – the world’s ultimate seven-day festival experience. 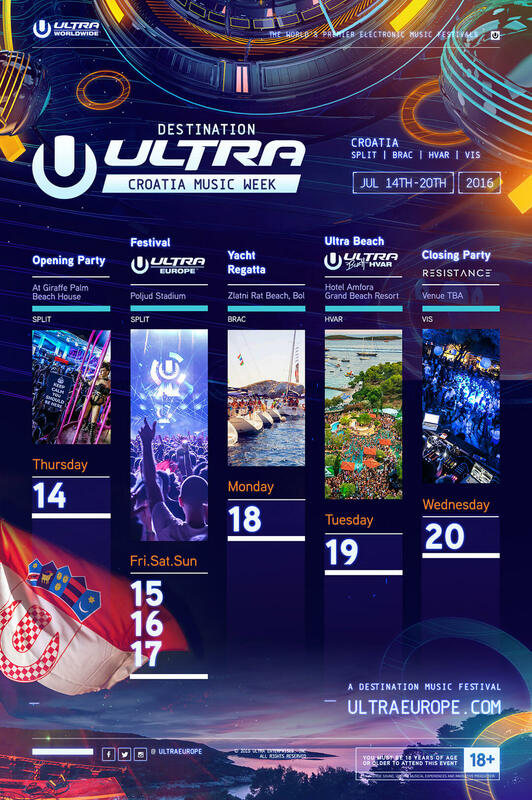 Showcasing a diverse array of incredible parties stretched across an entire week from July 14-20, 2016, ‘Destination ULTRA – Croatia Music Week ’ now gives electronic music fans the opportunity to experience a selection of events like none other, back to back, in some of the world’s most breathtaking venues and locations. From picturesque coastal towns to some of the most jaw-dropping islands across Croatia’s Dalmatian coast, ULTRA Europe’s unique run of events offers the perfect party getaway to fans looking to experience something different next summer. Destination ULTRA – Croatia Music Week kicks off on July 14 with the official Opening Party at the Giraffe Palm Beach House in Split where, in July 2015, ULTRA Europe and techno label Cocoon teamed up to bring Sven Väth and a whole host of his label mates to jumpstart proceedings. The experience will then move on to ULTRA Europe, the three-day festival at the Poljud Stadium, Split from July 15-17, where over 150,000 revelers are expected to witness electronic music’s most in-demand acts inside one of Croatia’s most majestic venues. Previous headline artists have included the likes of Afrojack, Armin van Buuren, Avicii, Axwell^Ingrosso, Carl Cox, David Guetta, Hardwell, Knife Party, Martin Garrix, Tiësto and Zedd and with the announcement of The Chemical Brothers only last year, there are guaranteed to be a few more surprises in store for 2016. This year also saw the debut of the RESISITANCE concept at Ultra Europe, where the likes of Apollonia, Guy Gerber, Jamie Jones, Marco Carola, Nic Fanciulli, Sasha, Solomun and many more, offered festivalgoers an alternative on Arcadia Spectacular’s inimitable ‘Afterburner’ stage. Following on from four mammoth days of partying in Split, and in exclusive partnership with Yacht Week, the Destination ULTRA – Croatia Music Week festivities move onto a one-off Yacht Regatta on July 18, which will see Zlatni Rat Beach on the Island of Brač host one of the most unique parties of the week. July 19 will then take us to Hvar for the fourth edition of ULTRA Beach, which will welcome over 5,000 people to the Hotel Amfora Hvar Grand Beach Resort. Headliners in the past have included megastars such as Dillon Francis, Diplo, Fedde Le Grand and Oliver Heldens, and with all three previous editions selling out, ULTRA Beach is yet again expected to be one of the highlights of the week. Finally, on July 20, Destination ULTRA – Croatia Music Week will close the curtain on what is set to be an incredible seven days of partying, with its RESISTANCE Closing Party on the island of Vis. ULTRA’s newest and most exciting concept, RESISTANCE, will return once again to close out the week. Registration for Ultra Europe is now open. Registered Early Bird tickets, priced at just €119, go on sale on Thursday, October 29, and will be available on a first-come-first-served basis exclusively to fans that register at ultraeurope.com before this date. For those looking to travel to any of the Destination ULTRA events across Croatia Music Week, please visit travel2ultra.com for tips, exclusive packages and much more. For all further details and ticket information, also head to ultraeurope.com.